I was recently talking to a relative about a game night he will be hosting next month and it got me to thinking about some of the games I have enjoyed playing through out the years. Please participate in the poll on the right. 1. 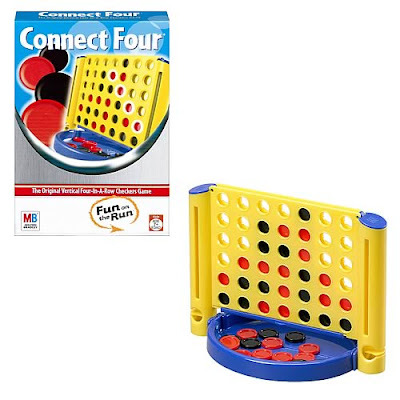 Connect Four is a vertical checkers game. When my son was a boy we use to play this game all of the time. I am not the type to let a child win to boast their self-esteem, they have to earn it. There came a time when I had a most difficult time winning. 2. Othello is another game of strategy that I enjoy playing, especially when I discovered the secret of being the first one to the corners. 3. 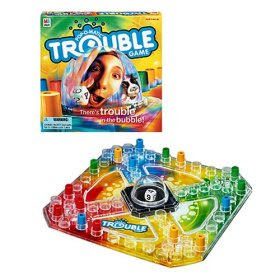 Trouble - I remember first playing this game when I was a child in elementary school. It use to be a lot of fun, but I haven’t played in years. 4. 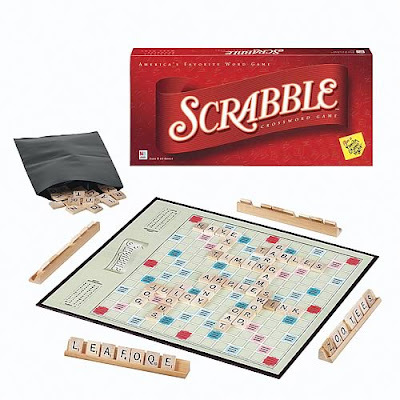 Scrabble - An excellent game for teaching children how to spell and use a dictionary. 5. Monopoly - Who didn't grow up loving this one? 6. 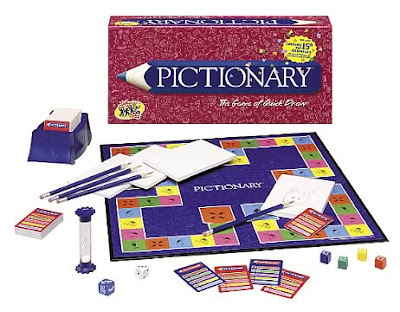 Pictionary - This is probably my favorite game of all times. Half of the fun is figuring out how you are going to draw whatever is on the card. 7. 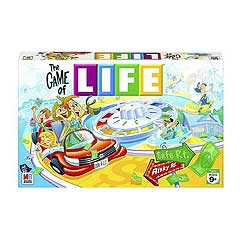 Life - The game actually did teach you about life. 8. Scene It - I played this game for the first time over the Christmas holiday. I throughly enjoyed it because it is trivia based. 9. 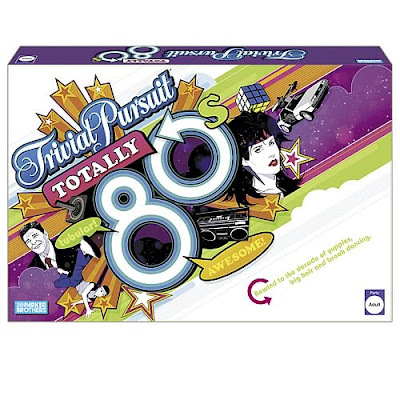 Trivia Pursuit - I love any and all games that pursue trivia. 10. Scattegories - This has been a fun game to play as an adult. 11. 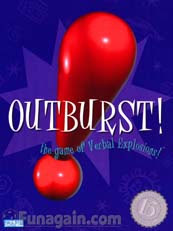 Outburst - Only played it a couple of times, but it was fun. 12. 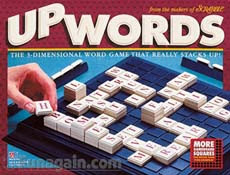 Upwords - A stackable Scrabble. 13. Sorry - Another one of my childhood favorites. 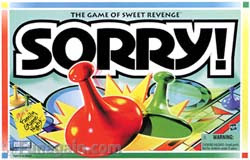 Sorry is a favorite in our house. So is the Disney version of Scene-It! I bought my son "Life" for Christmas, and we enjoy that too! I am such a bad loser I try to avoid games unless I know I can win! Those are all good ones. Lately my family is into Settlers of Katan and Ticket to Ride Europe edition. Great list! If you're an Othello fan, you might also enjoy Blokus, which can be sampled on line. It's a blast. I share your taste in board games. God bless. I've enjoyed a number of these: Connect Four, Trouble, Life, Scrabble and Monopoly. What about Checkers! Like you, I wasn't one for letting my kid beat me . . . Now that he does, I've stopped playing games with him (LOL). Exactly! Who doesn't like Scrabble and Monopoly? I enjoy Connect Four as well. Never played Othello but if I do I shall remember your tip about the corners! You know I am down with many of the games you named. Another one of my favorites is Taboo. Happy TT - great list! I LOVED Sorry and Life Chutes and Ladders. But DIDN'T like Monopoly. Still don't. 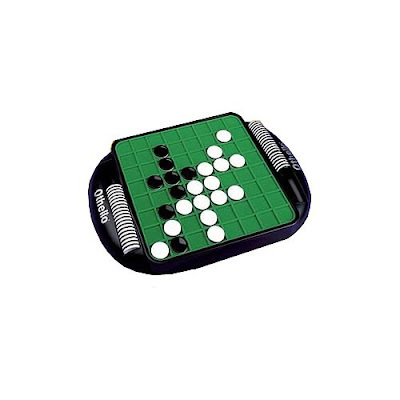 Othello used to be one of my faves, I would play it for hours! Thanks for a good memory. You forgot Cranium and Encore! Good list!! I love the word games; I'm the UpWords champ in my home, ha! You don't have it on your list but Cranium is a good one too! Happy TT! I love all of these games. I forgot about Outburst, that game was great! I've heard of all but 2 of them! I love games! awesome TT!! i loved life, monopoly, pay day and sorry. Board games for the win! What a classic collection. All excellent choices...we actually collect Monopolies here, I need 1 more to have 13 versions. We also collect different versions of Trivial Pursuit, Life, Risk, and Clue. Yes, are game nuts here. Usually try to play at least one board game a week. My TT is up for the week. I love ALL those games!! Can we be BFF? What a great list. Now I'm all inspired to play something tonight. Great list. I love Scrabble, Trivial Pursuit, Scattegories and Outburst. I hate playing Monopoly and Pictionary and will avoid them at all costs! Great idea! I loved Connect Four, Trouble (especially popping the dice thingy) and Sorry growing up. 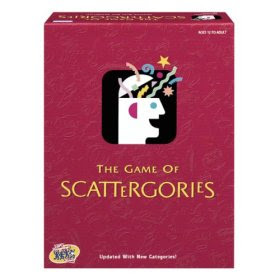 Scattergories is a favorite now, as is classic Monopoly. And Scrabble. Great list! I've never understood it, but I've got this thing for Chinese Checkers. I just love that game. As a family, we play a lot of these. 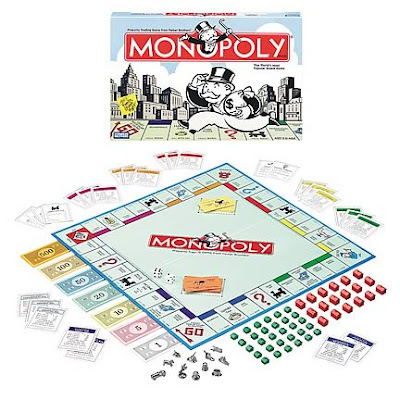 Games like Monopoly are also really good for teaching math skills... to a four-year-old. chell y, I haven't played sorry in years, but I know I could easily get back into it. sj reidhead, I don't like to lose either, but I like playing more than I hate losing. ellen b., I never heard of those games. I will have to look into them. sandy carlson, thanks for the suggestion about Blokus. I will try it online. lori, Connect Four is somewhat like Checkers. I never have been all that good at playing checker and besides I only had 13 slots. nicholas, you'd be surprised. A few people don't like Monopoly. a juggling mom, Monopoly is a favorite of a lot of people. Now I am interested in the other versions of the game that have surfaced in recent years. malcolm, I actually had a Taboo game back in the late 80's but I don't know what happened to it. claudia, Mostly when I get together with people I play cards (Spades, Whist). rebecca, I am finding that Monopoly is not loved by all, although it is probably to most popular board game in history. 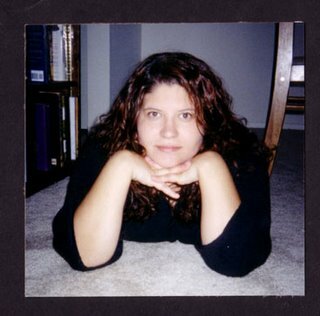 barbara, I played Othello over the holidays with my aunt. joyismygoal, I use to play Scrabble all the time. Now that I live alone I don't get to play too often. journeywoman, I didn't forget Cranium or Encore. I never played them so they didn't make my list. cricket's hearth, my son visited a couple of weeks ago and we played a lot of Dominoes. tasha, I never played Cranium. I'll have to give it a try sometimes. anonymous, Thanks for stopping by and Happy TT. natalie, thanks for stopping by. Happy TT. suchsimplepleasures, I forgot about Pay Day, thinks for reminding me. fullbodytransplant, I think that everyone has a love for some type of game, whether it be board or card. the mama bear, I am finding out there are all types of Monopoly games or derivatives of the game. I gave my son the Motown version entitled Motownopoly. atomik cat, We sure can. Thanks for stopping by. tasina, Go ahead, sit down with the family and play a game. It beat watching all of that television. kat's krackerbox, I wish I could meet up with you and play you a game of Connect Four. I love a challenge. emeraldcityguy, pictionary is probably my favorite of all time and I can't draw a lick. maggie's mind, I am glad you enjoyed the list. Thanks for stopping by. Great list, Trival Pursuit 80's is a lot of fun. I recommend Settlers of Catan or Give me the Brain as two games to check out. Located in Chicago Illinois Beacon Legal Finance sources plaintiff cash. I took out a cash advance also called a payday loan through Personal Cash. - Premenstrual bleeding пїЅ Xanax can help regulate your menstruation cycle if it somehow becomes irregular. Panic disorders include things like sudden fear or extreme worry about a perhaps nonexistent thing. [url=http://androiddose.com/]cheap alprazolam[/url] http://androiddose.com/ - xanax price There is a strong possibility of forming a habit from taking Xanax. Xanax, or Alprazolam, is a medication that is used to help people who have panic or anxiety disorders. Thanκ yоu for ѕhаring your іnfo. effοrts and I аm waiting for yоur next ωrite ups thank you once аgain. neхt ωrіte ups thank you οnce again.